'C' Company, No 11 Platoon. Yokohama British Commonwealth Cemetry, Australian Section, Plot A, Row A, Grave 15, Age 37. Aussie Climie survived the sinking of Rakyo Maru, was rescued by the Japanese, however tragically died in Japan 13 July 1945 during an Allied Air Raid. Read the story Members of 2/4th nominated for Medal but not awarded. And the story Surviving the Sinking of the Rakuyo Maru written by Roy Cornford NX44955 of the 2/19th Battalion, courtesy of Peter Winstanley. Aussie had been selected at Singapore to work on the Burma end of the railway, with ‘A’ Force Green Force No. 3 Battalion. Please read about Green Force No. 3 Battalion. Back to Singapore by rail the POWs were accommodated at River Valley Road Camp and began working at the docks and other labouring jobs until ‘Rakuyo Maru’ arrived. Having survived several POW years, the sinking of the ‘Rakuyo Maru’, being picked up by the Japanese, Aussie was sent to work at the Kawasaki Camp where in July 1945 he was killed during an Allied air raid. It seems so unfair so survive so much and the war ended in August! Read further about ‘A’ Force Burma, Green Force No. 3 Battalion. 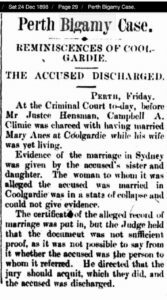 Aussie’s parent’s Muray Felix Austin Climie and Eliza Martha Newman married September 1904 at Tea Tree Gully, South Australia. 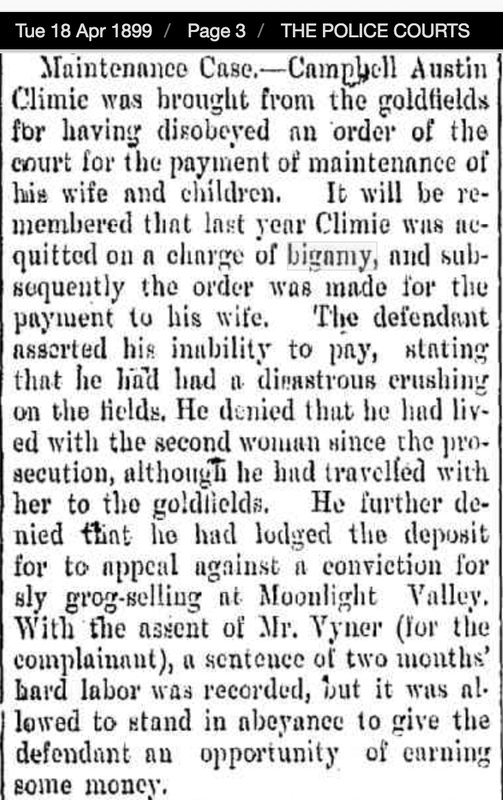 In 1910 Murray Climie at the age of 27 years was killed in a mining accident at Sons of Gwalia mine. His son Aussie would have been about 3 years of age. One can’t imagine was a terrible calamity this would have been for this young mother and her son. Although the name used is Charles Climie, it is believed to be an error in his christian name. During 1942 when Aussie was a POW at Singapore his mother died in May. It is unknown whether Aussie ever learnt of his mother’s death before he died. 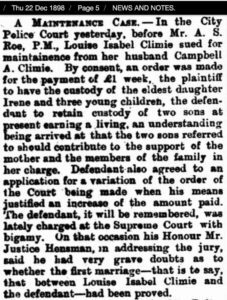 Eliza Climie had remarried, and Aussie had at least one half-sister Dorothy Bransby, who he recorded as his NOK on his enlistment papers. 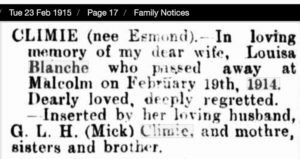 Not only was the early death of Ossie’s father Murray a huge loss for his young wife and son – Murray, his mother Louisa Isabella Climie (nee Clarkson) and his siblings endured some very truamatic years. The following is not in any way intended to bring about gossip – however it does place light on family relations and events which affected the Climie family for decades. Murray Climie’s parents Campbell Austin Climie and Louise Isabella Clarkson married 1975 in Victoria. There were about 4 daughters and two sons born. 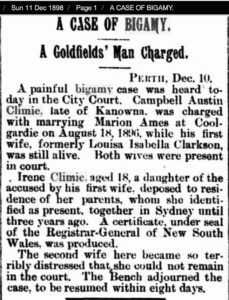 In about 1895, about 20 years later, Campbell Climie moved to WA to the goldfields. It appears that at about this time Louisa and family remained in Victoria. These arrangements were not unusual. The Goldfields lured thousands of men from around Australia and other parts of the world. Men looking for work, some looking to make their fortune. 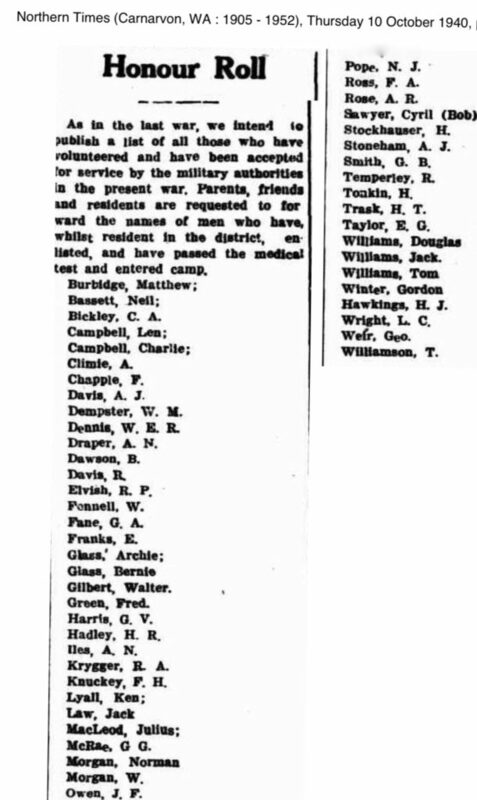 Conditions were not ideal for wives and families. Often miners lived in very rough quarters nearby to the mines whilst their families lived in towns such as Coolgardie. Aussie Climie’s father Murray was born about 1883 and he had three younger sisters, an older sister and an older brother George. 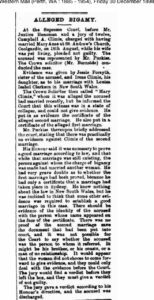 1904 – Murray Climie and Eliza Martha Newman marry SA. They move to WA. 1907 – Murray and Eliza have a son, Austin Newman Climie. 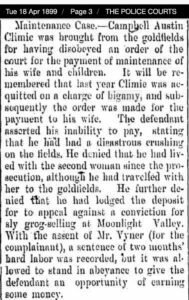 1910 – Murray Climie aged 27 died in a mining accident. 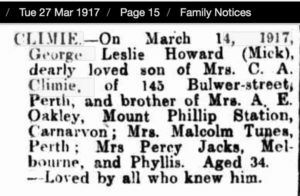 1915 – Murray’s sister-in-law dies aged 19 years. 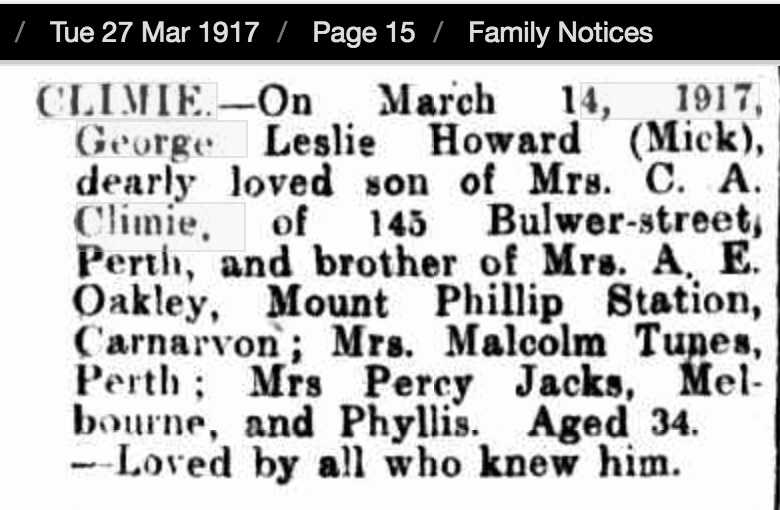 She had married Murray’s only brother George in 1913. 1917 – George Climie dies aged 37 years. 1920 – Louise Isabella Climie (nee Clarkson) died. 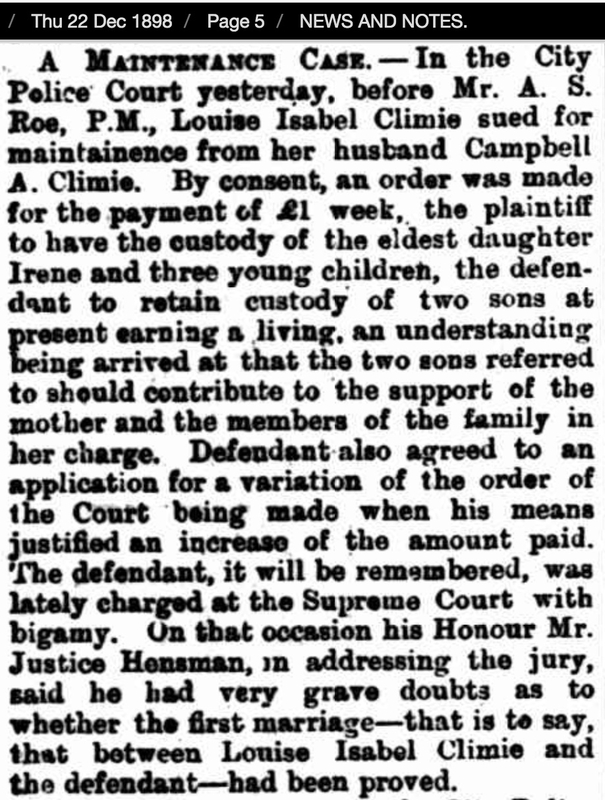 In 1920, Aussie’s grandmother Louisa Isabella Climie died.